Johnny Miller, a Colonel Sanders impersonator, ouside a Kentucky Fried Chicken restaurant in Yuma, Ariz. Colonel Harland Sanders franchised KFC for the first time in 1952, at the age of 62. Since then KFC has grown to operate in more than 15,000 locations worldwide. In the age of diploma mills, fast food and easy access to information, shortcuts are especially appealing. We look for ways to get to destinations quicker and favour environments where we can progress at a faster speed. In career and personal development, we can be in such a rush. This seems to intensify with each generation. “I want to be a millionaire by the time I’m 50” now seems “too late”, and has shifted 20 years forward to “by the time I’m 30”. Research shows that individuals of Generation Y shift jobs more than their predecessors in an effort to progress faster up the ladder. In a millenials survey by PwC, 52% of Generation Y respondents from around the globe stated that career progression was their number one priority when looking for an employer. But this need for speed isn’t limited to Generation Ys. No one is spared in today’s world from this craving to get things done faster. Sometimes, saving time is called “efficiency”, which isn’t a bad thing. But is the route that take us to a destination in the least amount of time always the best? There’s nothing wrong with ambition and career progression. However, I do wonder if today, we prioritise speed at the expense of other crucial elements. Surely, there are things in this world that only pure effort and commitment over a prolonged period of time can achieve. So at the dawn of 2014, I find myself asking: Do we have an unhealthy relationship with time? Is fastest always best? Mistaken in our view of time? I’ve been spending a lot of time with my 97-year-old grandmother recently. She has one of the healthiest relationships with time that I know. She eats, showers and sleeps at set times of the day. She is constantly early for appointments. She never procrastinates and I’ve never heard her moan about a task “taking too long”. She accepts that some tasks take a longer time than others (and that they are taking even longer as she ages), but she has never fretted about that fact. She still puts her head down and does it anyway, even if her vision and physical strength struggle to keep up. I’ve been pondering about our different approaches to the 24 hours we have daily, and I have come to a conclusion. My grandmother embraces time as a life-long friend and a necessary conduit for achieving outcomes. She is at peace with time. I, on the other hand, tend to see Mr Time as a source of frustration in what I am trying to achieve from day to day. Sound familiar? This may be due to the culture of our time and generation. But this is all the more reason to learn how we can improve the way we see and use time. Do you have peace with time? Can you truly accept the fact that some achievements will take longer than one year to accomplish? Perhaps even 30 years? If you’re a team leader, do you respect the time demands of every goal, rather than trying to rush through every single task with time as your No.1 foe? Time isn’t our enemy nor is it trying to sabotage us. Every task requires time as a partner. We need to give our tasks and journeys the time they need, without trying all the time to take shortcuts or achieve things faster. 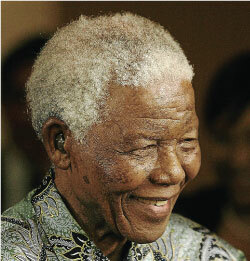 Nelson Mandela spent 28 years in prison, from 1962 to 1990. After this time, Mandela says he “came out mature”. From someone described as “passionate, emotional, sensitive, quickly stung to bitterness and retaliation by insult and patronage”, he became the self-controlled man we remember him to be. 1. We understand the principle when it applies to buildings. In the huffing and puffing childhood fable of the three little pigs, the house built with straw and sticks had no chance against the might of the big bad wolf. The house made of brick, though it took longer to build, had a strong stucture that could protect its inhabitants from the wolf. The time invested into laying each brick, and the sacrifices made on playtime paid off. Similarly, when we inspect new buildings, we frown when contractors have cut corners to achieve the final product. More effort, time and expense would make long-term differences to the strength and durability of the building. The principle is the same in our personal growth. There are things that require effort and time, for which there are no shortcuts. It works the same with those we lead. The growth journey takes time and involves pain. Just like we shouldn’t cut corners in our own journey, we shouldn’t cut corners for those we lead. The pain of growing and the essentiality of time are things we should not try to deprive them of. Discussions in the human resources circle have accepted the fact that Generation Y individuals crave growth and engagement, and for this reason, will move if they no longer feel engaged or find challenge in what they do. Whilst true that chasing roles for progression has become a norm today, individuals should be wary about being serial job-hoppers. Several involuntary moves due to company circumstances may be understandable. But constant movement may cause employers to doubt your decision-making and be hesitant to invest in you, writes Jacquelyn Smith in a 2013 Forbes article. Frequent movement will also deprive you of truly understanding the nature of a company. Staying long enough to see projects from birth stage to completion, and understand the ups and downs in a company, will inject depth that constant movement cannot. The work of Orville and Wilbur Wright changed the world, and the Wright brothers embraced the need for time to achieve their dream of building a flying contraption that could carry human weight. They knew it would take years of experience and deep understanding to pull off this dream. They didn’t let the need for time, trial and error to deter them, and successfully built a plane in 1903. Character and maturity is only deepened though experience and time. Nelson Mandela wasn’t always the self-controlled man most of us remember him to be. The 28 years he spent in prison, from 1962 to 1990, moulded him into a different man. In Mandela’s Way by Richard Stengel, the young Mandela is described by his closest friend Oliver Tamboas as “passionate, emotional, sensitive, quickly stung to bitterness and retaliation by insult and patronage”. Stengel, who spent three years with Mandela to pen the book, prodded Mandela to articulate how prison had changed him. “Over and over, though, I used to ask him how prison had changed him. How was the man who came out in 1990 different from the man who entered in 1962? “This question annoyed him. He either ignored it, went straight to a policy answer, or denied the premise. Finally, one day, he said to me in exasperation, ‘I came out mature’,” writes Stengel. Through the time in prison, Mandela developed a “radar and a deep sympathy for human frailty”. “By maturity, he meant that he learned to control those more youthful impulses, not that he was no longer stung or hurt or angry. “It is not that you always know what to do or how to do it, it is that you are able to tamp down the emotions and anxieties that get in the way of seeing the world as it is,” Stengel explains. In prison, Mandela learned to adapt his approach and control the way he exhibited emotions. While prison time may have broken the spirit of many men, it strengthened Mandela’s resolve to pursue his purpose: a South Africa with equal rights for all. Time, and the seasons and trials it can bring, is the best teacher of maturity if we embrace its teaching potential. We may not be in prison like Mandela, but even in the context of our leadership and career journeys, time is the best developer of depth and maturity. If the name Harland David Sanders doesn’t ring a bell, then maybe Kentucky Fried Chicken does. Colonel Sanders, as he’s better known as, had gone through a host of failed careers before finding his niche. These included being a motel operator, failed political candidate and even an amateur obstetrician! But by the time he was in his 40s, Sanders was sure of one thing. He had a fantastic fried chicken recipe. After years of perfecting the recipe, in 1952 at age 62, Colonel Sanders franchised Kentucky Fried Chicken for the first time. By the mid 1960s, it had expanded to more than 600 locations. Today, it operates in more than 15,000 locations throughout the world. I wonder how many of us could be like the Colonel and only find our niches later in life. The Colonel’s example is a good reminder of the value of time in finding what out you’re really great at. It doesn’t always need to happen in the first five years of your career. We need time to fail, and we need to fail in order to learn. Time is also needed to build credibility. Just ask a fresh graduate to teach a group of CEOs, and you’ll spot this immediately. While ideas can be generated in an instant, experience requires time, and credibility requires experience. Last year, I met celebrated mountaineer Sir Christian Bonington while he was in Malaysia. Best known for leading the first ascent of the 12,000 ft south face of Annapurna, Bonington also successfully led a British expedition to the first ascent of the immense south-west face of Everest in 1975. I asked him what leadership lessons he could share from his experience in mountaineering and leading expeditions, and knew I had to lap up every word. He offered three principles, including making firm, clear-cut decisions. Bonington, who has been mountaineering since 1951, spoke with authority, because these weren’t principles he had read in a book or heard from friends and colleagues. He had experienced everything he was talking about first-hand, including the consequences of bad decisions. Only experience can give such credibility. Time is also needed to build relationships of trust, and increase the weight of our influence. The film Mary Poppins is a classic and well-loved by many. But it took Walt Disney 16 years to even convince Pamela Travers, author of the book Mary Poppins, to agree to make it into a film. Disney first made contact with Travers in 1944 to pitch the idea to her. She refused. Disney visited her every year until 1960 when she finally bought in to Disney’s vision for the film! There’s a story that’s often used to illustrate the importance of seasons of struggle. Intending to help the butterfly speed up this process, the man takes a pair of scissors and snips an opening to let the butterfly emerge. The butterfly comes out easily with a swollen body and shriveled wings. But as the man continues to watch it, its wings remain in the same condition and are too weak to support the body. In cutting the cocoon open for it, the man had destroyed the butterfly’s ability to fly. He did not realise that the struggle through that small hole was necessary to push the fluid in the butterfly’s body to its wings. Just like the butterfly should ideally have formed spikes to guard itself from being “helped” in this way, we too need to be weary that others are not cutting our struggles short. Put yourself in the place of the butterfly. Don’t let anyone deprive you of the necessary growth pains you’re going through. Embrace the season, and leverage the learning potential of this time. Similarly, like the man, don’t rush to provide a shortcut to the necessary struggles of others. Approach life again as a learner. We all know this principle, but as we achieve more and get caught up with tasks, we tend to forget the importance of being a student of life. Here’s a parable from Maximum Performance: A Practical Guide to Leading and Managing People at Work by Nick Forste. Picture a young martial artist kneeling before the Master Sensei in a ceremony to receive a hard-earned black belt. After years of relentless training, the student has finally reached a pinnacle of achievement in the discipline. “Before granting the belt, you must pass one more test,” says the Sensei. “I am ready,” responds the student, expecting perhaps one final round of sparring. The Sensei waits for more. Clearly, he is not satisfied. Finally, the Sensei speaks. “What is the true meaning of the black belt?” asks the Sensei. “A symbol of distinction and the highest achievement in our art,” says the student. The Sensei says nothing for many minutes, waiting. Clearly, he is not satisfied. “The black belt represents the beginning – the start of a never-ending journey of discipline, work, and the pursuit of an ever-higher standard,” says the student. Do you approach life like the student in the first and second instance, or the third? Do you chase achievement after achievement, or do you step back, see it all as an unending journey of learning and embrace time as a friend in this process? In an age where we crave speed and instant solutions, let’s revisit and ingrain in ourselves again the importance of time, and the outcomes that only time can bring. Be friends with time. Enjoy and embrace every moment and be weary of rushing though or running away from necessary seasons of struggle and growth pains. There are no shortcuts to building character, maturity, credibility and influence. Lily Cheah is on her own journey to correct her approach to time and find a balance between speed and efficiency, and not skipping over valuable experiences along the way. Do you have a thought to share on the value of time? You can reach her at lily.cheah@leaderonomics.com. Click here for more articles. Is Fear Just A Four-Letter Word For Opportunity? Caution: Are You A Victim Of A Fixed Mindset?